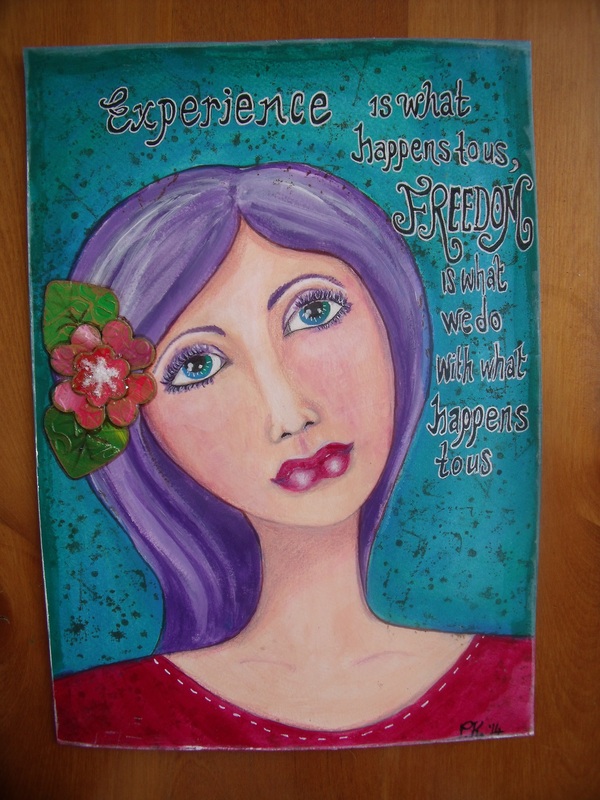 Experience Is What Happens To Us ……. 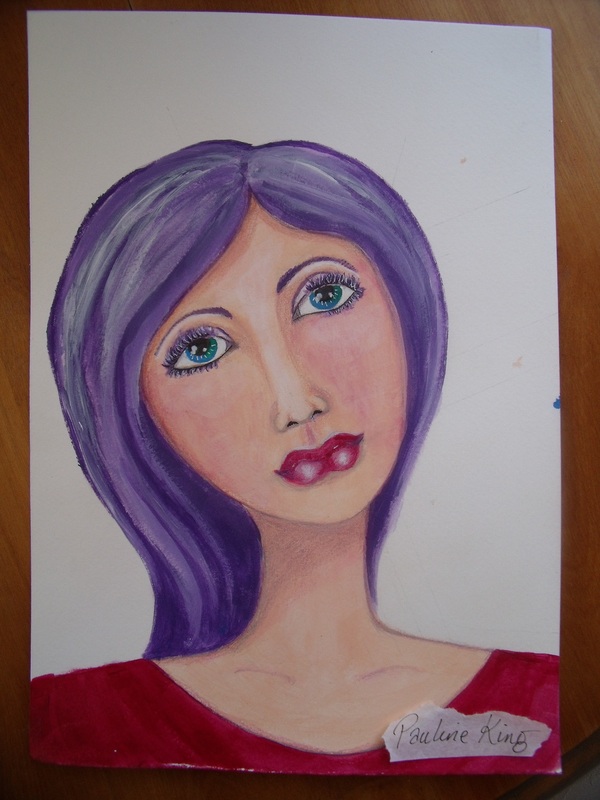 Hi there my bloggie friends, just a quick post to round off my weeks work – I set to and finished my mixed media girl. She’s gorgeously bright with her purple hair and red dress and blue-green background and will look fabulous in a frame! I think she will make nice cards and postcards too, do you? This entry was posted in Creations From My Craft Room and tagged bright colours and thoughtful words, collage, mixed media painting by thecontentedcrafter. Bookmark the permalink. Pauline, I found your blog by accident but am very excited that I did. I found the girl in the painting had a wistful look, as if she is seeing something in her future, definitely not sadness. I am very impressed. I like to look at art, I would look all day if I could. I spent over an hour just gazing at the Mona Lisa in the Louvre, until my eyes got tired😄. Congratulations on your blog! I popped by your blog too and had a quick visit – I decided to hit ‘follow’ so I can read some more of your travel adventures. Did I miss your anniversary post? Thank you Elaine – and that is a lovely name! No, you have not missed my anniversary post, it is due at the beginning of March – which [gulp] I have just realised is only a week or so away…. Thank you for the reminder! I very much like her mantra! so true! and the painting is wonderful and yes! will make great cards! It’s mostly pretty cool isn’t it to have a creative true love – I like that! The eyes stand out … and sadness was my initial reaction, and I see you mentioned that in a comment. Good saying to match. Great work Pauline … and I wanted to stop by to say hello as I’ve been a bit on the busy side. Hello Frank, thankyou for taking the time to pop by and say hello, I appreciate it very much. I know how busy you must be – when is the big move? The move is set for March 19th … so crunch time is approaching, so I continue trying to be a bit ahead to make the final days less hectic. Time will tell if I’m successful. Good luck with it all Frank – though luck plays only a very small part, it is mostly good management really….. So good management Frank and Mrs Frank! Wow! What a difference the background makes. It’s like a whole new painting. She’s quite beautiful, though she makes me a little sad. Does she reflect what you are feeling or am I reading too much into this at the end of an exhausting day? Your talents amaze me. It’s always a treat to stop by. I’m glad you aren’t sad. I’m also glad that those first 40 years are behind you so that the next 40 will be wonderful and all you deserve.